This is a bridled tern video. In Saudi Arabia and Bahrain, not just cruel regime torture of human rights activists. Also, beautiful birds, like bridled terns. 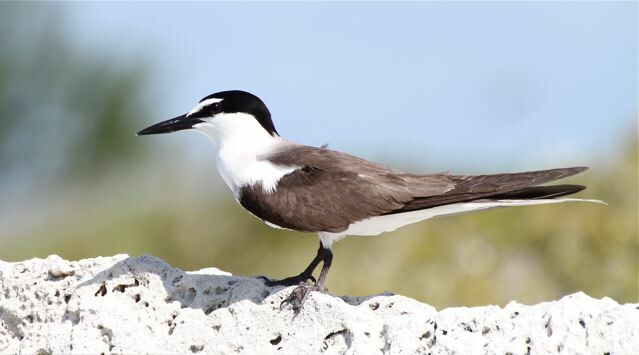 The Bridled Tern Sterna anaethetus is a common summer breeding visitor to offshore islands in the Gulf and Red Sea. Brian Meadows (Bull B.O.C 2003) mentioned 175 pairs breeding on islets north of Yanbu al-Bahr 18 June 1993. Summer visitor to all coasts nesting on islands occasionally. In 1988 Jennings visited the Farasan Islands and found the species to be a very common breeding tern and a survey of summer breeding seabirds by SF Newton in 1994 in the Saudi Arabian Red Sea found they were the most abundant and widespread breeding seabird. The aerial count total of just under 20,000 is likely to be a gross underestimate. Most nests were under bushes but a few small colonies on Farasan use rock overhangs on cliffs in the absence of vegetation. Both the al Wajh and Farasan Archipelagoes hold large populations and the species is abundant on the well vegetated outer islands of the Farasan Bank where it co-occurs with Brown Noddy. Clutches were always of a single egg and hatching commenced in mid June. In the Gulf large numbers breed on the Bahrain and Saudi Arabian offshore islands with eggs hatching in early to Mid-June. Karan(27°44’N, 49°50’E) is the largest of the six coral islands measuring 128 hectares in size (2025m x 625m). This island has the largest breeding population of Lesser Crested terns in Saudi Arabia as well as good numbers of Bridled Terns and White-cheeked terns and a small number of Swift Terns. Jana (27°22’N, 49°54’E) is the second largest island being 33 hectares in size (1105m x 300m). Large numbers of Bridled tern and small numbers of Lesser Crested Terns and Swift Terns nest here. Juraid (27°11’N, 49°52’E) is the third largest coral island measuring 20 hectares in size (732 x 282m) and holds the largest breeding population of Bridled Terns in Saudi Arabia, with good numbers of breeding Lesser Crested Terns and White-cheeked Terns. Kurain (27°39’N, 49°50’E) is the second smallest island with a size of 8 hectares (312m x 251m). Large numbers of Lesser Crested Terns along with good numbers of Bridled Terns and White-cheeked Terns nest on this island. Cousin Island Seabird Census completed! This entry was posted in Birds, Environment and tagged Bahrain, Saudi Arabia by petrel41. Bookmark the permalink. Thanks for the link! Yes, there are Atlantic and Arabian bridled tern subspecies.